Just completed a groom and groomsmen collage for an upcoming wedding. Theme was 'the Ratpack' ....... Photoshop CS3 Beta. All done in separate layers - I noted the file size grew to 886 Megabyte - just as well it wasn't on the old laptop Just love that MacPro ............ swweeeet !! Sketch o’the Week- Eddie Van Halen! Creature from the Black Lagoon!!! 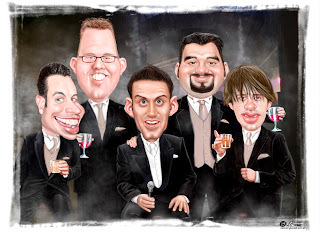 Caricaturist's.... artist's & friends ! Copyright is important and a legal right of the artist who owns the material. All the images / cartoons / caricatures that I create AND post here, are my property and I have the copyright on them. No one is allowed to use them without my direct permission. The divine Mrs Cherie Blair ! !